Our first heavy humbucker of the 21st century, the D Sonic™ is a high-output bridge humbucker designed for the extended low end and heavy chords that dropped tuning delivers; with serious treble response for single-note solos and standard tuning. 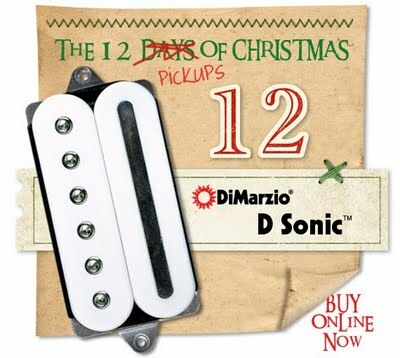 The D Sonic™ is more than just a one-sound pickup, too. In addition to the standard series humbucking sound, our patented design utilizes 4-conductor wiring to access two different single-coil sounds plus parallel humbucking mode, for three additional sounds that are distinctive and versatile. Art Rodriguez, Brad Delson, Bruce Allan, Chris Brouelette, Ginji Ogawa, Jarle H. Olsen, Jason Miller, Joey Bochar, John Petrucci, Kiko Loureiro, Marco Sfogli, Matt Aub, Mike Martin, Mr. Scott DiGioia, Paul Warren, Rich Roger, Rob Balducci, Tim Gibson.